I’ve already discussed the Smurfiness of one Belgian beer and the thinking behind pixie marketing. Well, Smurfmania is apparently about to hit us all in a new media blitz surrounding their 50th anniversary this year. 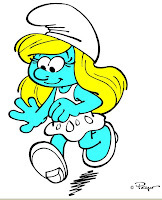 The Smurfs are being relaunched at events all over Europe, and a new film is in the works. A 3D film no less. America’s National Public Radio has been helping to spread the Smurfy joy across the pond with this story, which is now the third second most emailed link on NPR’s website. Best line of the piece: “But there have been detractors over the years. Some Americans felt the Smurfs’ communal village depicted a ‘communist utopia.’” Ah, the Cold War, I miss it so. La la la la la la, la la la la la. UPDATE 2041 CET: Teri Schultz, the NPR reporter here in Brussels, tells me: "I had more fun stuff about the anti-communists who hated them but we had to cut it for time! They criticized the fact that there was no money and that everybody just did their pre-ordained job all day and that all smurfs shared equally in the profits of the mushroom village. They took this very seriously! There was actually a time when Peyo introduced money (with Finance Smurf) but he ended up just showing the evils of it and took it away again. People asked him all the time about being a communist and he just laughed it off, as he did with every label people tried to put on him and his little creatures."